I should begin by saying that I have read all of the books so far in the Ruth Galloway series. I truly love this series, it is one of my favorites. I have been eagerly awaiting this, book 6, in the series. And it was fine, but for some reason, just fine. The characters of Ruth, Cathbad, and DI Harry Nelson are excellent as usual. The reader can see growth in these characters, within themselves and their relationships with each other and other characters. The mystery still involves a background of archaeology, but certainly not to the extent of earlier books. The plot is a little overly crowded with characters and story lines. It involves the discovery of an executed Victorian “child killer’s” body, a TV crew anxious for a high profile story, a child’d death and mother’s suicide, and current child abductions. Ruth is right in the middle of all of it, from discovering the body, to being involved in the TV program, and investigating the abductions. 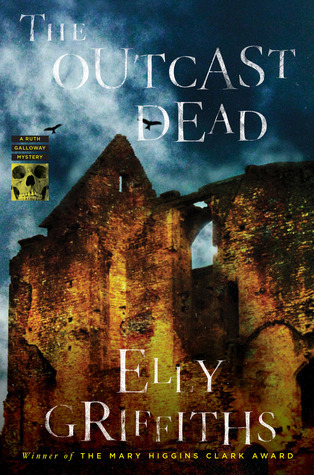 This book, The Outcast Dead, was more about relationships, particularly the relationship between parent and child, Mother Hook and her “children”, Ruth, DI Nelson and Kate, Judy, Cathbad, and Michael, among others. Children are involved in every plot line, in every conceivable way. This seems to have occurred at the expense of the archaeological aspects, the mystery, and for me very importantly, the setting. I missed that mood that the setting of these books usually evokes. It was just not here in the this outing. I will continue on with this series and see where it goes from here. I am hoping the next book returns more to the feel and style of the early books. As a side note, there are several references to early books, so I think this would be best read as part of the series, not a stand-alone. This entry was posted in Book Reviews and tagged book, mystery, review.